A new report has claimed that the Osun state PDP gubernatorial candidate, Senator Adeleke did not graduate from Jacksonville State University, as claimed. Ademola Nurudeen Adeleke, senator representing Osun West Senatorial District and the state’s PDP gubernatorial candidate, did not graduate from Jacksonville State University (JSU), says the authorities of the public university located in Alabama, United States. According to his profile on the National Assembly website, Adeleke has a Diploma in Criminology from JSU and graduated in 1986. He also graduated from Ede Muslim Grammar School, Osun State, where he obtained an Ordinary Level Certificate. His academic claims have, however, been brutally challenged. According to recently circulated claims, Adeleke registered for GCE O’ Level in 1981 but had F9 in English Language and was recorded absent for other subjects. It also said he has no degree from JSU where he registered as Jackson Ademola Adeleke, while providing what it titled as official records of his enrollment. 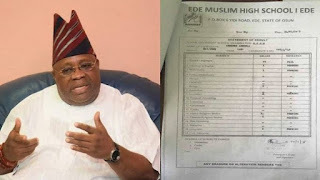 Dele Adeleke, Ademola Adeleke’s junior brother, has denied the allegations and encouraged those who disagree to verify the senator’s result at his alma mater. “Do you think the APC would not have raised the issues if he did not have the authentic certificates?” he had asked. The ICIR can, however, confirm that Adeleke did not graduate from Jacksonville State University, though he has claimed otherwise. Buffy Lockette, the Director of Public Relations at the university, in response to a mailed enquiry, told The ICIR that though the senator enrolled at the tertiary institution, he was not awarded any degree. When The ICIR checked the West African Examination Council’s website to view Adeleke’s O’ level result using examination number 19645/149 as circulated, the site replied, “result not available for this candidate in the specified year and exams diet”. The Council’s online result verification portal, which claims to contain data from 1980 to 2018, was also consulted with the same details. The result was brief: “candidate does not exist”. Demianus Ojijeogu, WAEC’s Head of Public Affairs, told The ICIR all candidates’ results are in the custody of the Council and should be accessible on the website, regardless of performance in the examination. “Even if the candidate has F9 throughout or is absent throughout, it is accessible,” he said. He, however, added that the Council is still working on results of candidates who wrote in 1981 and the surrounding years. “You know there is this change of nomenclature in our examination. We used to have SSCE then WASC, and now WASSCE. So, we are trying to update the website; maybe they took some down.” He promised to confirm and provide feedback on why the results are not presently online. Meanwhile, two members of the People’s Democratic Party (PDP), Rasheed Olabayo and Oluwaseun Idowu, have as a result of the controversy applied to the Osun State High Court for an order setting aside Adeleke’s election as the party’s flag bearer in the September gubernatorial election. Olabayo, in his affidavit, said the senator truly attended Ede Muslim Grammar School “but did not leave with a School Leaving Certificate having absented himself from the school leaving examinations but for English where he scored a failing mark of F9”. One of the exhibits provided to the court and obtained by The ICIR is Adeleke’s senior secondary school examination statement of result recently collected from Ede Muslim High School. It shows that the candidate had an F9 in English Language, while grades for Literature in English, Mathematics, Biology, Economics, Islamic Religious Studies, Christian Religious Studies and Geography, were said to be pending. Ruling on the plaintiffs’ ex-parte application on Thursday, the court gave Adeleke six days, that is till August 1, 2018, to provide his certificate. “It will be inequitable not to allow the respondent to come and show his certificate if he has any but if given the opportunity to present side of the case, the balance which is necessary for interlocutory injunction would be adequately considered,” noted Justice David Oladimeji. Though a newcomer to Nigeria’s elective politics, the 58-year-old senator appears to be flying from triumph to triumph. He was largely unknown politically prior to the demise of Isiaka Adeleke, his older brother, who passed away on April 23, 2017. Following a bye-election held to fill the vacuum left by Isiaka in the Nigerian senate, he was declared to have had a landslide victory, winning in nine out of 10 local governments. He admitted this was due to his brother’s “historical goodwill” and influence. On Saturday, Adeleke found himself a step closer to his political ambition as he was declared PDP’s gubernatorial flag bearer in Osun State, after he narrowly defeated Akin Ogunbiyi with a seven-vote difference. Though what he notes as his target achievement is “to sponsor Bills that would be impactful on my people, especially youths and women”, the senator has in fact not notably sponsored any bills since his election into the red chambers. On the contrary, he has become notorious for his vigorous, entertaining dance moves and his fondness for flaunting these in public â€• a trend that has earned him the name, “the dancing senator”.